The Chatters01263 715779work01603 870304fax Self-cateringThis light modern property provides very spacious accommodation for four. It is set in Sculthorpe, well known locally for the Hawk and Owl Trust sanctuary. The North Norfolk coast is a short drive away, or bring your bikes and enjoy the cycle paths and country lanes. This shows the modern exterior of The Chatters. 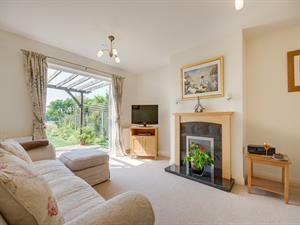 This light modern property provides very spacious accommodation for four. It is set in Sculthorpe, well known locally for the Hawk and Owl Trust sanctuary. The North Norfolk coast is a short drive away, or bring your bikes and enjoy the cycle paths and country lanes.